Getting from relaxed hair to natural hair isn’t easy and it’s quite often for one to get frustrated in the middle of the process, especially when not cutting all the permed locks off at the same time. Additionally, even women with natural hair find the managing of their curls a bit challenging, to say the least. The hair texturizer may be the solution you’re looking for, but you always need to keep in mind that you need to give it time and you have to arm yourself with a lot of patience until you notice the results. Should you use a hair texturizer for going back to your natural hair? Hair texturizer or hair relaxer? How do hair texturizers work? Do hair texturizers work all the time? If you’re aiming for a free of texture-altering chemicals, then the hair texturizer isn’t the solution you’re looking for. The market does give you all natural texturizers and they do loosen the hair texture and make it easier to style and to handle. Hair texturizers do loosen the curl pattern, but they’re still formulated with chemicals, no matter the concentration of natural ingredients within the formula. The hair texturizer may be seen as a “relaxer lite”. As you may already know by now, relaxers are made to straighten for good your hair, whereas the hair texturizers are only going to loosen your curls. Nevertheless, both of these products include straightening ingredients. It’s either calcium hydroxide (no-lye) or sodium hydroxide (lye). As you’re going to leave the hair texturizer for less time on your hair, it’s only natural that it’s less powerful than the hair relaxer. 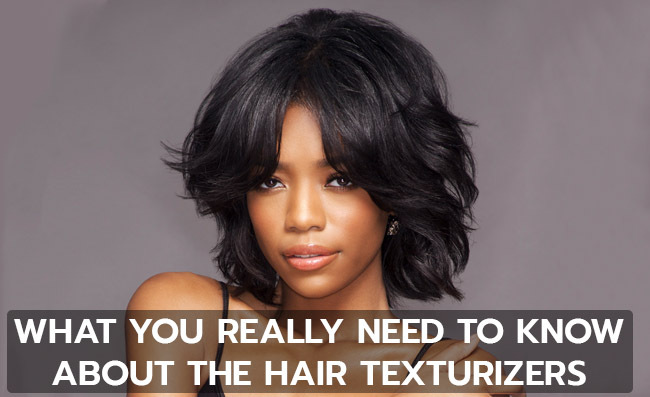 On the side note, keep in mind that even hair texturizers do change your natural texture. Once you’ve put some texture-altering chemicals in your curls, your 100% natural mane is all gone. Your hair stylist may give it a try and convince you to start using a hair texturizer, for better manageability. Willing to accept your hair texture is another thing to note though, while you’re trying to get back to your natural hair. Truth be told, they’re quite often confused. They’re both used for straightening your hair, but the hair relaxers present a more concentrated form of sodium hydroxide, leading to different results. The hair texturizer is more gentle than the hair relaxer and it’s made to only loosen the curls, and not to remove it completely, as the hair relaxer is intended to be able to do. The hair texturizers are able to loosen the tight curls thanks to the sodium hydroxide within the formula. In order to better understand which hair texturizer works the best for you, it may be helpful to get how sodium hydroxide reacts to the protein bonds in hair. It’s also important to know the difference between the hair texturizer and hair relaxer, even though they kind of lead to similar results. No matter which way you go though, it’s essential to get a hair texturizer kit that includes within its formula conditioning ingredients that take care of your hair’s health too. Many neutralizing shampoos come with a hair texturizer. Hair strands include keratin amino acids that create the one-of-a-kind shape of your curls, ensuring their elasticity too. The hair texturizer is in fact able to break this protein, straightening the hair after a while. The difficult to manage and curly hair becomes easier to handle and to style when you’re using a hair texturizer. You can get hair texturizers over-the counter in a local drugstore or get one from your hair-stylist that sells his/her own brands. The active ingredient within the formula is sodium hydroxide and anything not including it, should be avoided. You don’t want to take any chances when using a hair texturizer. Not only you’re not going to have no results, but you may even damage your hair when using a low-quality texturizer. RELATED POST: Geranium Oil-Good for Your Skin, Good for Your Hair! It seems that hair texturizers do give better results on short hair, so if you’re thinking about a short hair style, a texturizer is the right choice for you. You’re going to have to trim your hair all the time, which is going to help you remove all damaged hair. Additionally, you’re not going to worry that much if the new growth matches the previously processed hair either. If your hair is rather, it’s quite a gamble when you’re using a hair texturizer. Keeping a nice and even texture from touch-up to touch-up may be a real challenge even for your hair-stylist. Some strands of hair may straighten entirely, whereas others may remain as curly or wavy as before. The risk for some kinks not to turn into waves isn’t null either. In reality, the hair may go from afro-textured to a dry and damaged mess, which isn’t something you want. Getting the curl pattern (S-shape) may be impossible to get in some cases, when using a hair texturizer. If you’re determined to get 100% natural hair, the hair texturizer isn’t the best choice for you. But if you’re only aiming for easier to handle and to style curly hair, the hair texturizer is the option to go for. Hi! I'm the Editor in chief of the Beauty Section on Sugar&Fluff. I'm making sure that you get the best information on the latest beauty products and techniques for your skin and hair. I hope you have a useful time on our site! Copyright 2018 Sugar and Fluff. All Rights Reserved.